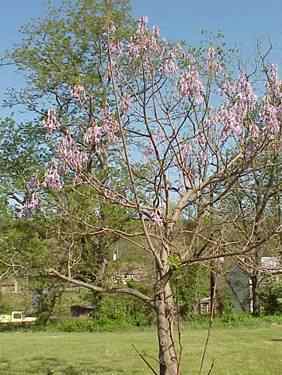 Tree: short thick trunk and wide rounded top about 40 feet tall. Native to China. Leaves: 5 to 15 inches long, Heart shaped velvet like. 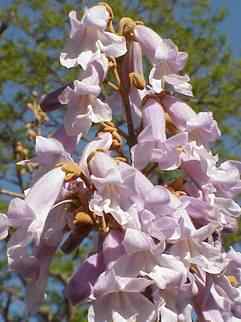 Flowers: Blue or pale violet 2 inches or more long, in panicles. Fruit: In cone shaped dry capsules 1 to 1.5 inches long. Seeds small and numerous. Use: Ornamental. Has escaped into the wild.